Families are trying to stay alive in dark, ill-equipped shelters in Eastern Ghouta. The shelters are not supplied with enough water or food, and children have not seen sunshine for weeks. As fighting continues in Syria despite a UN resolution calling for a ceasefire, Trócaire says it is receiving tragic news from volunteer aid workers in the capital Damascus. The Irish overseas aid agency works with a number of organisations trying to provide relief to the victims of the civil war, which has raged since the so-called ‘Arab Spring’ of 2012. The government of Syrian President Bashar al-Assad has been able to remain in power thanks to the backing of the Russian government, which is providing air power to bomb rebel-held areas such as Ghouta, which lies to the east of Damascus. Trócaire’s executive director Éamonn Meehan described the messages that he is receiving from colleagues working in Syria as ‘heartbreaking’. In Ghouta, the civilian population is having to remain in underground shelters, with little food or water, because of almost constant bombardment and air strikes. Much of the city’s infrastructure has been reduced to rubble. 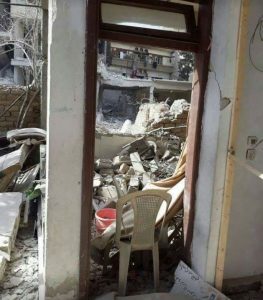 For example, an organisation that supports women affected by the conflict, Women Now, has had to close all three of its centres in Ghouta, with two of those centres completely destroyed. Éamonn Meehan commented: “The basic rules of war have been long forgotten by the many actors in this brutal conflict. Civilians are not safe. They are denied food, protection and other humanitarian assistance. “The international community can no longer stand idly by as this devastating human tragedy continues to escalate. There is an urgent need for a ceasefire and guaranteed access for humanitarian organisations to provide aid to the civilian population.